A lot of people may be wondering, what is this gratitude that people are always talking about? The answer is, it is an emotional state of feeling thankful and appreciative or more obviously, grateful. Research and studies have been done that show that daily gratitude exercises have a real impact on levels of energy, stress, enthusiasm and focus in addition to increasing reciprocal kindness to others. Even if you don’t believe it will have that kind of an impact on your life, the simple fact is, the world is too beautiful a place to not feel grateful for being alive. And if you are reading this…you are alive! That alone is worth celebration! Now how can we start to practice Gratitude..
1. Awareness: Become aware of the things happening in your life. The gifts you are given on a daily basis. Be aware of the people around you. Be aware of the things you feel you couldn’t live without. Here are some questions that will give you an easy start to this: What are you proud of today? Who do you love today? What can’t you live without? What is great in your life right now? 2. Appreication: Now that you are aware of every little thing in your life, appreicate and love it. However big or small appreciate its presence in your life here and now. Acknowledge the gift that it is and realize the role it plays in your life. 3. Affirmation: However often you desire, affirm your gratitude in the things you appreciate in your life. 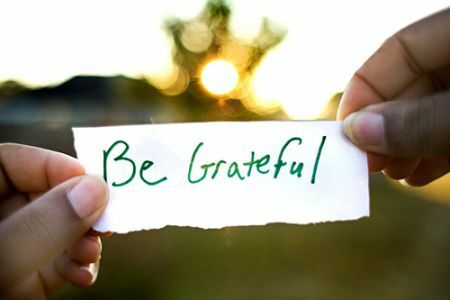 Reaffirm the things you are grateful for. Go for a walk and practice affirmations that will increase the emotions of gratitude. What are affirmations? They are phrases you say with emotional conviction. Here are a few examples: I am grateful for my health. I am grateful for all of the love in my life. I am grateful for my life. OR I am living with an attitude of gratitude. All I need is within me Now. 4. Abundance: Create an abundance of gratitude in your life. By following 1-3 this will be inevitable. The more of a presence gratitude is in your life, the more you will feel it on a constant basis. Live it and breath it on a daily basis to see how your energy, your passion and your happiness increase! This is YOUR life!! Love it! Embrace it!